How Brazil became a breeding ground for an outbreak. Fig. 1, Mosquito eggs incubating in water. The day Adriana Reis got the rash, the state utility agency had shut off water to her street. There was nothing unusual about this: In Adriana’s neighborhood the agency schedules one day with running water, then two without. The rash, however, was out of the ordinary. It began on her belly, a touch plump with the baby growing inside her, and spread down her legs and arms. Her joints hurt. Her head ached. She called her doctor. Her doctor was worried. Adriana’s symptoms were consistent with those of three mosquito-borne diseases tearing through their city. The three diseases — dengue, chikungunya and Zika — have similar symptoms. The doctor had a guess as to which one Adriana had. Only a test could prove it. If it was dengue or chikungunya, Adriana was likely entering an uncomfortable but impermanent period of feeling lousy. As for Zika, the consequences could be graver: She was 14 weeks pregnant, precisely the moment of pregnancy when the bud of stem cells in a fetal head is blossoming into a brain. Zika has been found to attack these cells, permanently stunting brain growth, most commonly with a disorder called microcephaly — micro for small, and cephaly, for condition of the head. When the attack is violent enough, the fetus may miscarry. Babies that survive struggle to walk, talk, see and learn. Health authorities in Brazil believe that in the roughly two years since Zika began spreading in the country it has attacked thousands of fetal brains, causing a spike in microcephaly cases. In Adriana’s city, Recife, hundreds of these babies have been born, more than in any other city in the world. On her doctor’s orders, Adriana boarded a city bus to a medical lab for tests. Adriana Reis waits outside of a crowded maternity clinic for her number to be called. Fourteen-weeks pregnant, she will soon find out if her test results for Zika are positive. 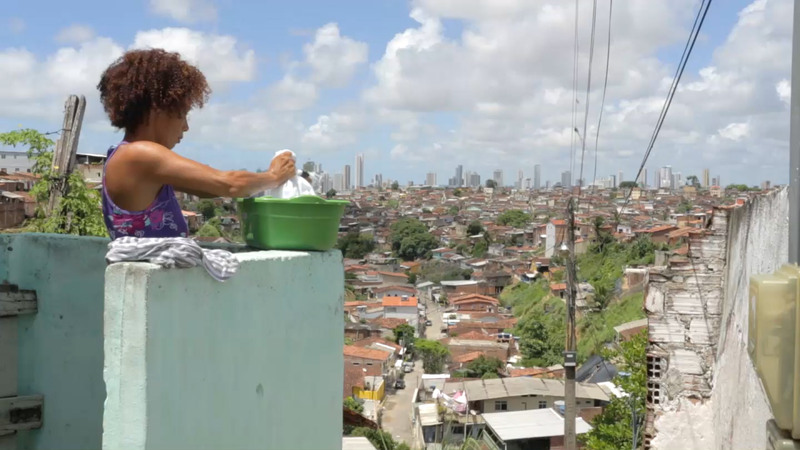 Adriana is one of roughly 80 million Brazilians who live in homes where water does not flow through the pipes every day. For the days that it does not, solutions abound: Across Recife, blue tanks roost on roofs. Barrels are stationed next to backyard sinks for laundry. Buckets collect rainwater for the garden. Pails stand sentinel next to toilets. The northeast corner of Brazil, where Recife is, has suffered a prolonged drought — but that isn’t the main problem, said Rômulo Aurélio de Melo Souza, technical director of the state utility agency, Compesa. It’s that the demand for water has always overwhelmed Compesa’s ragged distribution system. Among the difficulties: The system is ridden with crumbling asbestos cement pipes. If Compesa turned on water to all of Recife at once, he said, they would burst. The city might become a panorama of geysers and puddles. Rômulo is a practical man who speaks in confounding detail about infrastructural woes. The “ghost of scheduling,” as he describes it, is worse in the rural areas outside of Recife. Some towns receive water once a week. Others once a month. In the worst cases, trucks haul water into town squares. Residents line up with barrels. They lug them home, and dip in for the wash, for the dishes, for drinking. They make it work. Fig. 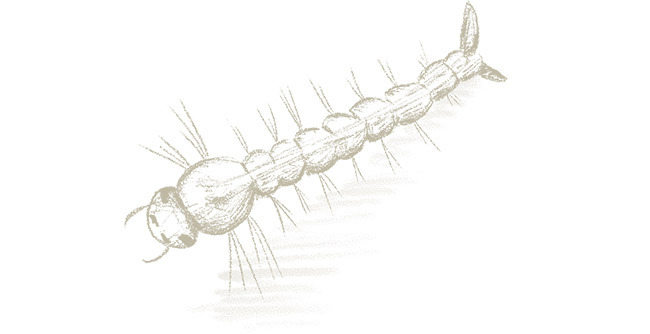 2, Aedes aegypti larva. The Zika virus is carried by Aedes aegypti mosquitoes. From the moment they arrived in the Americas on African slave ships, misery accompanied them: Wherever they appeared, disease followed. The breed likes warm, wet weather, and soon populated the entire midriff of the Western Hemisphere, from northern Argentina to the American south. Aedes aegypti is not the only species to carry the disease, but it is likely the most efficient: It happily takes up residence in human dwellings, biting many people in a row. If it feeds on a sick person, the disease incubates in its belly, then migrates to its salivary glands. It is injected at the next bite. Once a female has drunk enough blood, she seeks still water. She lays her eggs at water’s edge; the eggs stick to the container’s wet walls. Within days, they hatch into wormy larvae, which grow into spermy pupae, which sprout wings and fly away. An estimated 80 percent of Aedes aegypti mosquitoes breed in water tanks. Until recently, the two diseases associated with the Aedes were yellow fever and dengue. Now it brings new plagues: Zika and chikungunya. Both diseases were confined to the Eastern Hemisphere, but recently — no one knows precisely how — migrated to the West. In December 2013, chikungunya was found in the Caribbean. In May 2015, Zika virus was identified in Brazil. Industrious Aedes have since helped them spread. The crisis has been met with ingenuity and urgency: The Zika virus now occupies petri dishes around the world, genetically modified mosquitoes have been released and vaccines have been fast-tracked. The classic tools of mosquito eradication have also been deployed: Space-suited fumigation teams mist whole towns with pesticides. Merchants have made small fortunes selling bug spray. In Brazil, pervasive billboards and TV ads illustrate the art of avoiding mosquitoes. Once upon a time, such tools worked. After World War II, Brazil’s military dictatorship crusaded against Aedes with the toxic pesticide DDT. In 1958, Brazil announced it had killed the last one. But as surveillance weakened and DDT was banned in most countries, the mosquitoes slipped back in, their eggs hitching rides in the puddled corners of container ships or the watery belly of a truck’s spare tire. Upon arrival, they found plenty of breeding sites. As the mosquitoes returned, so did disease. After six dengue-free decades, Brazil had its first outbreak in 1981. The situation has deteriorated: Last year, 1.6 million people in Brazil were diagnosed with dengue, more than ever before. Chikungunya and Zika have infected hundreds of thousands more. This time around, Brazil’s chief defense against mosquitoes isn’t pesticides. It’s people like George Wallenberg. 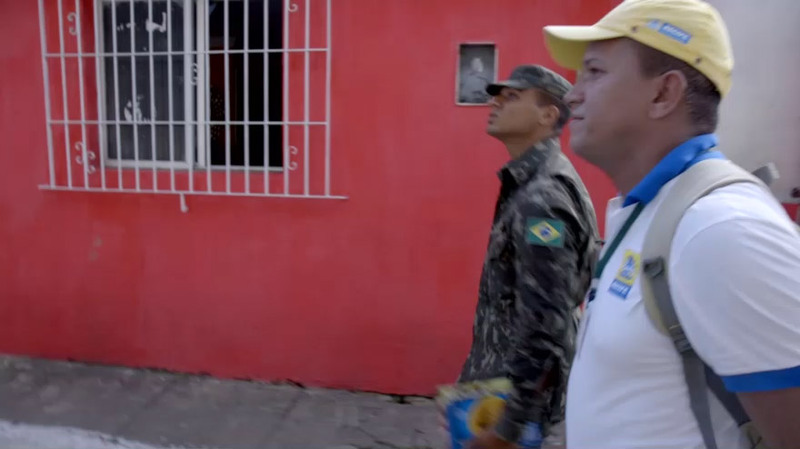 Biologist George Wallenberg conducts door-to-door inspections in the neighborhood of Alto José Bonifácio, where there are more mosquitoes than anywhere else in the city of Recife. George, a 30-year-old biologist with an air of calm competence, is one of 46,500 environmental workers who engage in door-to-door combat with mosquitoes year round. 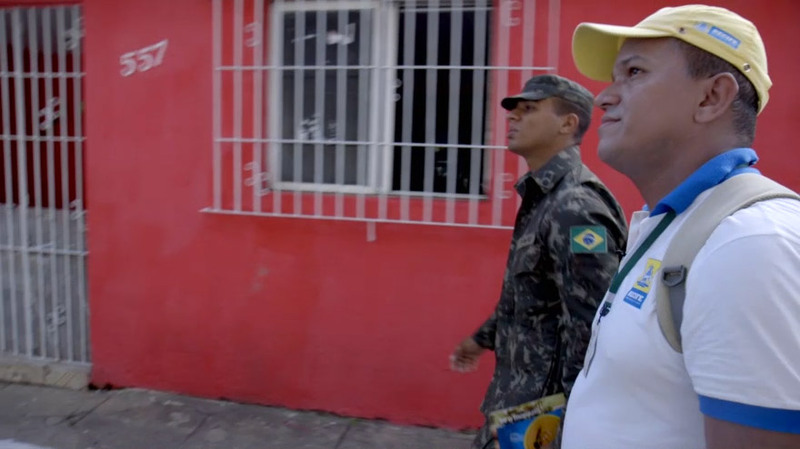 Early this year, their ranks were supplemented by 220,000 soldiers — reported to be the largest military deployment in Brazil’s history — and another quarter-million community health workers. Teams were deployed to Brazil’s most disease-ridden cities, including Recife, which at 3.7 million is also one of the country’s largest metropolitan areas. George wields two weapons against his tiny enemy: A canister of powdered larvicide, which, when sprinkled into standing water, kills baby mosquitoes, and a stack of educational leaflets. Each has its flaws: The larvicide only lasts a few weeks. The leaflets only help people who read. So he talks his way through people’s front doors and then schools them on mosquito abatement. He scrutinizes their property for places a homemaking mosquito could lay her eggs: The crumpled can in a bush. The tray under a houseplant. A water tank with its lid ajar. Every two months, George and his colleagues pause to assess their work. 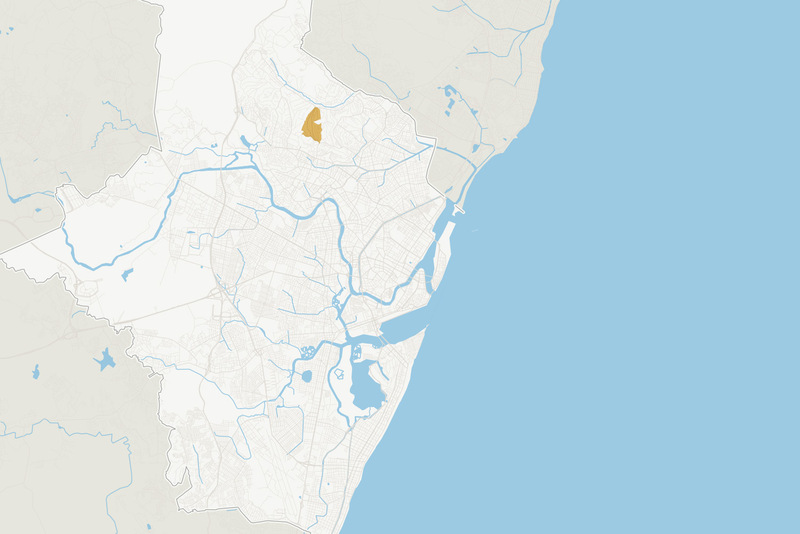 For each of Recife’s 94 neighborhoods, they calculate the percentage of homes where they found mosquito larvae. The more larvae, the higher the neighborhood ranks on the city’s mosquito index. In the past two years, the neighborhood of Alto José Bonifácio, where Adriana lives, has regularly ranked highest. 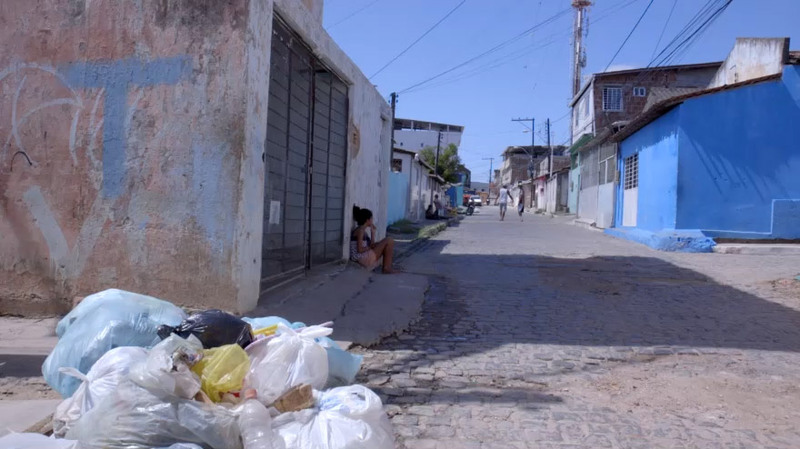 One of the poorest neighborhoods in Recife, Brazil. Intermittent running water, houses need to store water. The highest mosquito index in the city. Door-to-door work has counteracted the momentum of an outbreak before. Recife’s health secretary, Dr. Jailson Correia, said that the last time soldiers were called to bolster the city’s door-to-door efforts, in a 2015 fight against dengue, new cases of illness did not halt, but they did slow. Which is a lot better than nothing, he said. So in early March, George and his team spent several days knocking on doors in Alto José Bonifácio. One morning their knock was answered by Crislene Feitosa, mother of three. Her doctors say her youngest, 10-month-old Jayane, was one of Recife’s first cases of Zika-related microcephaly. Jayane was born in May 2015 — months before the surge in microcephaly cases was flagged by health officials. Crislene has remained skeptical that Zika caused the disorder because she had no symptoms during her pregnancy. But Jayane’s doctor, Dr. Ana van der Linden, noted that 80 percent of Zika cases are asymptomatic, and that Jayane’s brain malformations are identical to those seen in Zika-related cases. Crislene Feitosa was told her daughter, Jayane, had microcephaly shortly after she was born. Doctors predict Jayane will have impaired sight, decreased mobility and cognitive abilities, and will need care for the rest of her life. George wandered through Crislene’s home, inquiring about her habits: If she uses repellant; whether her yard collects garbage; how often she takes her kids to the doctor. She answered confidently: She keeps a repellant dispenser in her children’s room; she cleaned the yard just last week; she takes Jayane to at least two appointments a week. When George asked where Crislene stores the family’s water, she led him to a plastic barrel in the kitchen pantry. 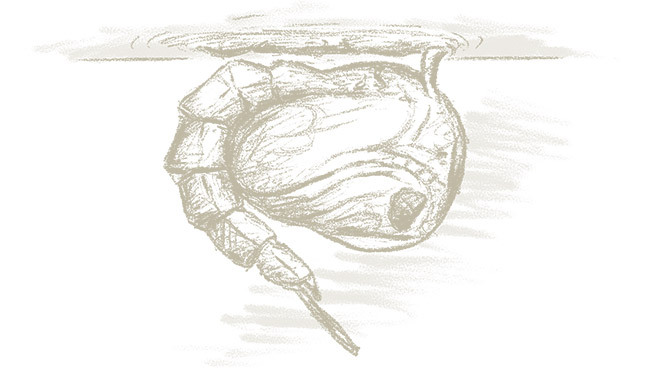 He pointed to a slit between the tank and the lid. “They can get through this crack here,” he said. “My husband puts the lid on upside-down,” she said, flipping it over. George peered closer. “That’s worse,” he said. George pulled out his clipboard and began lecturing: Every time you use water, immediately replace the lid. Check regularly for mosquito eggs. Once a week, empty the barrel and scrub it. Fig. 3, Mosquito pupa floating under the water’s surface. Many factors dictate whether a neighborhood like Alto José Bonifácio swarms with disease-carrying mosquitoes. Some are macro: Globalization, for instance, allows both bugs and disease to travel with ease around the world. And urbanization has herded humans into such close quarters that even a lazy mosquito can engineer a small outbreak. Other factors are more local: Whether window screens or air conditioners are common in a neighborhood. 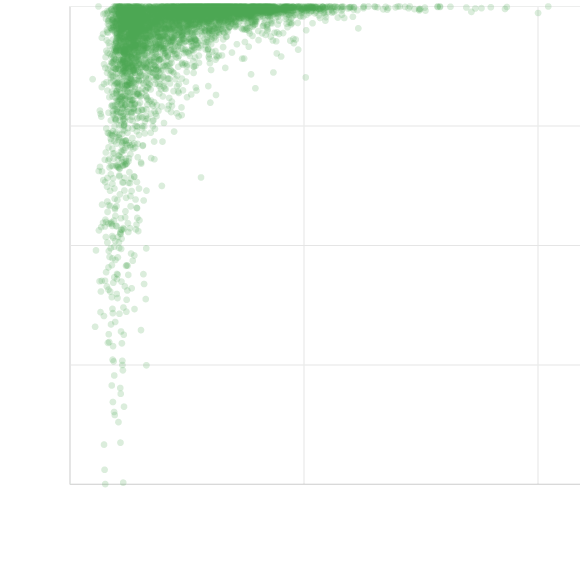 How much time people spend outside, and precisely when. And the quality of the infrastructure stitched through a community. Crislene named another variable: “Economic status.” From its perch on a hill on the northern end of the city, Alto José Bonifácio has a direct view of the skyscrapers that rise from Recife’s richest neighborhoods below it. The people who live in those skyscrapers, she said, get water every day. While all of Recife’s 10 wealthiest neighborhoods receive a constant water supply from Compesa, only three of the 10 poorest do. 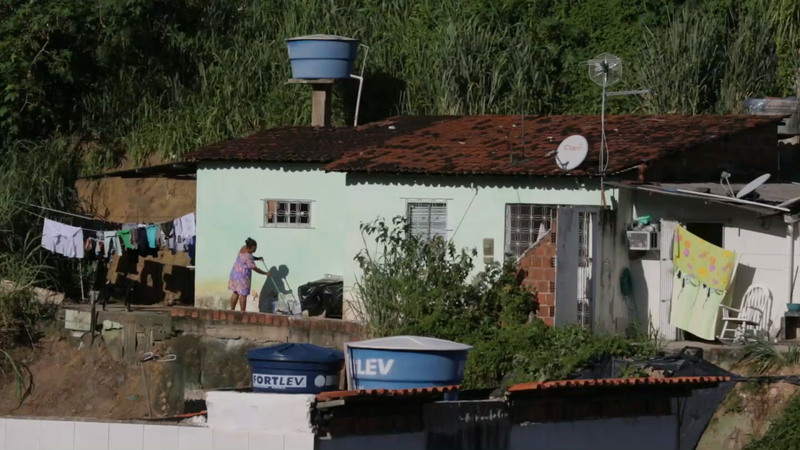 That second list includes Alto José Bonifácio, the sixth poorest neighborhood, where as of the last census residents lived on an average of 307 reais a month, around $170. The city’s mosquito index gives an indication of the relationship between water supply and mosquitoes: Of Recife’s 10 most mosquito-ridden neighborhoods, seven must store water, whereas none of the least mosquito-ridden neighborhoods do. 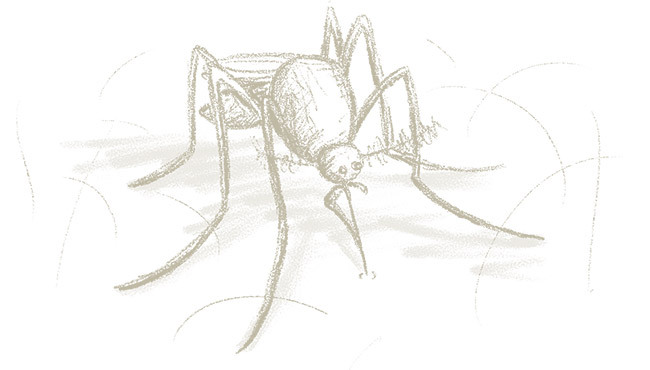 Mosquitoes are, by nature, indiscriminate: They breed in standing water anywhere and would happily bite as many rich as poor, if given the chance. But they get more chances in places that store water: Dr. Correia, the city health secretary, says that an estimated 80 percent of Aedes breed in water tanks. The inequities go beyond running water. Trash pick-up is less reliable in poor places, and Aedes breed in the water that pools in uncollected trash. Rainwater drainage was not accounted for when many of Brazil’s poorest neighborhoods were erected, so puddles form and persist. And in some 60 percent of Brazil’s homes, sewage does not flow into a sewer that leads to a treatment plant or septic tank; instead, it often flows into open backyard pits, or through open channels in the street. Aedes prefer fresh water, but make do with wastewater in a pinch. All this adds up to more mosquitoes: Larvae are three times as likely to be found in the city’s poorest neighborhoods as its richest ones, according to a FRONTLINE analysis of the mosquito index. It’s less clear how this translates to the spread of Zika and other disease. Mosquito-borne diseases do not tidily keep to poor neighborhoods: People are not always bitten at home; mosquitoes find them at work, in the park, or at their uncle’s house. If mosquitoes are rampant in one neighborhood, people throughout the city suffer. 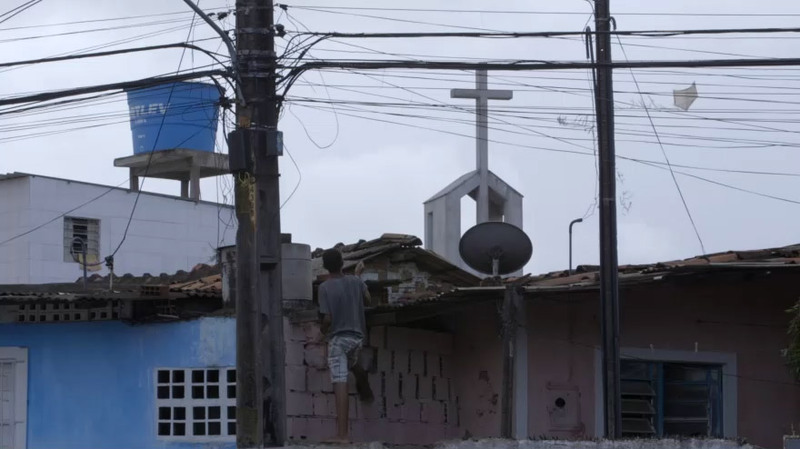 Nonetheless, the diseases are reported at higher rates in Recife’s poorest neighborhoods. 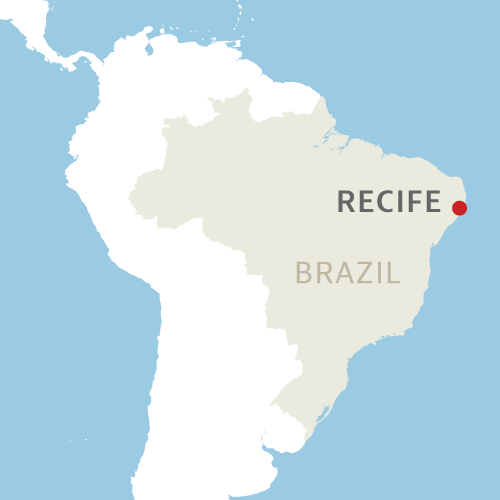 And in Recife’s state of Pernambuco, 97.8 percent of suspected microcephaly cases whose birthplace is known were born in public hospitals that serve the poor, rather than private clinics frequented by the better off. But Dr. Léo Heller, who has devoted his life to researching health and poverty in Brazil for Fiocruz, Brazil’s foremost public research institute, insisted otherwise. 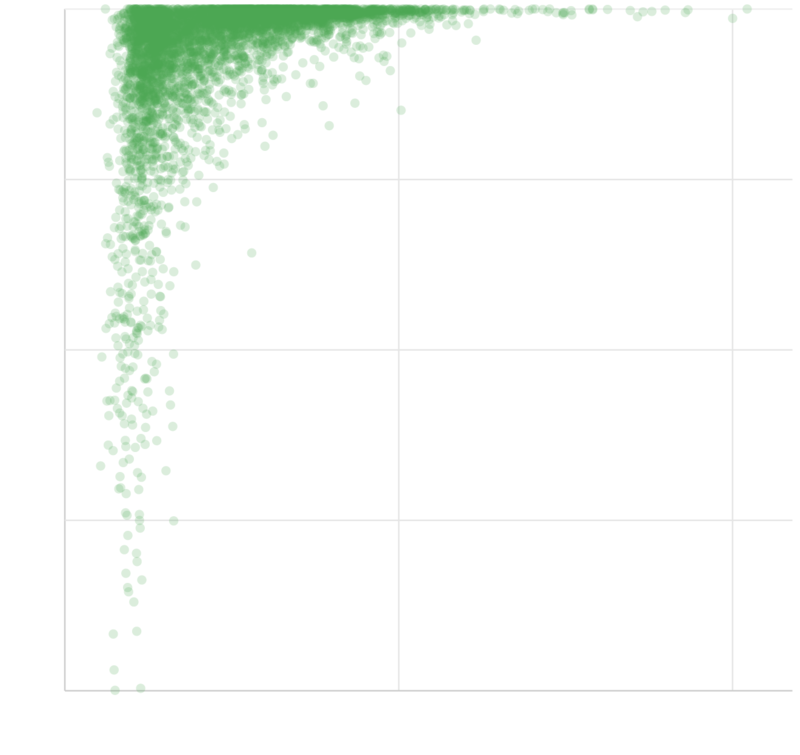 “The distribution of diseases is not random,” he said. Brazil has a storied history of prioritizing rich people’s infrastructure, he said, leaving poor people undeniably more vulnerable to disease. Dr. Heller has silver hair and a fondness for black coffee and Brazil’s classic cheesy bread, pão de queijo. He speaks gently and with conviction. The epidemic, the professor says, was foretold by inequality built right into the city’s bones. Fig. 4, Adult mosquito emerging from pupa. Some countries have water problems caused by lack of water. Not Brazil, which has a fifth of the planet’s water reserves, making it one of the most water-rich nations on earth. The city has a long history of these liquid treasures being unequally distributed. Recife’s first pipes were laid in the 19th century by entrepreneurial foreigners, who, expecting a return on their investment, built a system of private fountains and charged for water by the barrel, often hauled by slaves. Later they offered indoor plumbing — to neighborhoods deemed to afford it. It wasn’t until 1968 that the federal government finally established a system of state-held utilities. In the state of Pernambuco, that effort created Compesa. 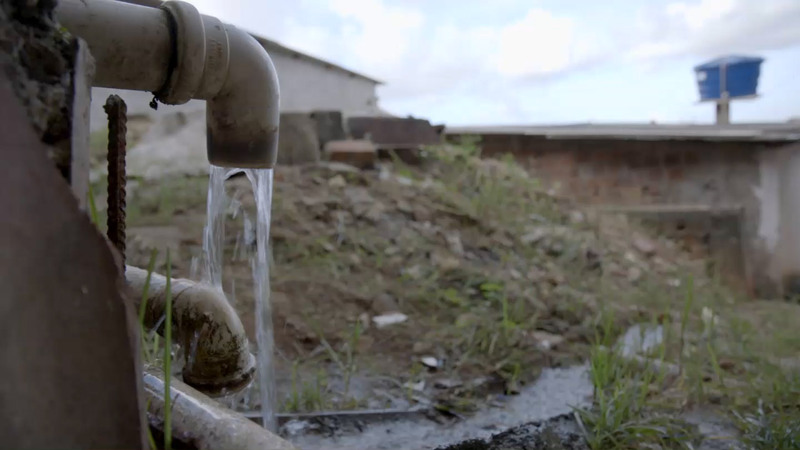 Over the next decades, access to basic water service in Brazil nearly doubled. But again, the poorest were left out. Providing service to poor people “was often the last priority of cash-strapped water utilities,” observed a World Health Organization report in 2000. In 2009, the government finally launched an initiative to provide equal infrastructure to all its citizens. Dr. Heller, the professor, was enlisted. He led a team that catalogued the nation’s panorama of water and sanitation problems. That study evolved into the National Plan for Basic Sanitation, or PlanSab. In 2013, with little pomp, PlanSab was signed into existence by President Dilma Rousseff. Aided by a boom in the economy, the early 2000s were a period of growth and optimism in Brazil. Finally, the country's historic sanitation access inequities could be addressed. PlanSab was ambitious: Within 20 years, it promised, 99 percent of Brazilians would have access to water, and 92 percent would have access to sewage treatment service. It promised to provide universal trash collection in urban areas, and improve rainwater drainage across the country. The federal government would spend 300 billion reais (roughly $140 billion at the time) over 20 years to achieve all this. Heller was pleased with the plan’s aspirations, but worried about its methodology. It did not bind the government to follow through on its financial promises, and he fretted infrastructure might not remain a priority. Also, PlanSab relied on public-private partnerships, a model that has failed to erase infrastructure inequality elsewhere in the world. Nonetheless, Heller was cautiously optimistic about what was certainly the most ambitious plan to fix Brazil’s infrastructure problems in his lifetime. “All is not hopeless,” he wrote in an editorial on the eve of PlanSab’s approval. That year, 2013, the government spent more than it ever had on sanitation infrastructure. Projects were greenlit. Shovels broke ground. PlanSab began with promise. Fig. 5, Aedes aegypti biting a human. When it was published in late 2013, PlanSab laid out two “plausible scenarios” for Brazil’s economic future. The first was unapologetically optimistic, anticipating that Brazil would enjoy a 4 percent annual economic growth rate and only a touch of inflation for the foreseeable future. The second was darker: Just 2 percent annual growth, and 6 percent inflation. No matter which came to pass, PlanSab had strategies to achieve its goals. The plan did not strategize for the scenario that unfolded next: The economy didn’t grow — instead, it shrank by 3.8 percent in 2015. Inflation topped 9 percent. Millions lost their jobs. The economic crisis, initially tied to the fall of global oil prices, was aggravated by a smoldering graft investigation that erupted into a massive political scandal. More than 100 people have been arrested in connection to the scheme, including some of the nation’s most powerful politicians and business leaders. A cascade of other corruption investigations have followed: In May, President Rousseff was suspended from office over a budgetary scandal; her replacement has been convicted of campaign finance violations. Meanwhile, the country has drawn ire from its own citizens for its expenditures on the 2014 World Cup and this month’s Rio Olympics. Among the casualties of this upheaval has been PlanSab’s momentum. PlanSab had intended to more than double its annual investment in water and sanitation, which averaged 7.6 billion reais a year between 2002 and 2012. But in PlanSab’s first full year of life, 2014, it failed to reach that goal: Investments of 17.6 billion reais were promised, but only 11.4 billion were spent. Brazil’s Ministry of Cities, which oversees PlanSab’s finances, says steeper cuts have followed. A study by a major newspaper estimated that at least 5,000 public works projects in Brazil have stalled since the crisis began. In Recife, Rômulo, Compesa’s technical director, rattled off a host of projects stopped or deferred. The largest, a 1,300-kilometer pipeline, would carry water to the desiccated interior of the state. Federal funding slowed to a trickle midproject. The pipeline was meant to serve 2 million people in 60 towns. Today it serves one town of 70,000. Not everyone agrees. An analysis by trade organization National Confederation of Industry concluded that at the current rate, PlanSab won’t achieve universal water by 2033, as promised. More like 2063. And a report by pro-industry health organization Trata Brazil Institute concluded that in 2014, water and sanitation investment has been twice as high in Brazil’s wealthiest cities as its poorest. Improved water access was just one of the aims of PlanSab, which also sought to increase the regularity of trash collection in the poorest neighborhoods. Brazilians have boisterously criticized the government over the economy, the corruption scandals, and the profligate spending on the World Cup and the Olympics. But when it comes to the Zika crisis, they place blame elsewhere. A national survey found 75 percent of Brazilians blamed each other for the proliferation of mosquitoes; just 15 percent blamed any part of the government. This was reflected in dozens of interviews with Recife residents; many pointed to a specific neighbor who wasn’t careful enough. Unprompted, only a handful expressed anger over poor services. To Heller, this lack of anger is a nod to human adaptability and resilience. But it is also, he said, the product of an ubiquitous educational campaign that insists mosquitoes can be vanquished through vigilance alone. “It’s like the government telling the people that they are mainly responsible for the situation,” he said. When Crisline Feitosa's stored water supply runs low, she transports water in a pail from her aunt's reserve next door. Residents say this neighborhood sometimes goes "15 days to a month" without water. The health minister of Pernambuco, Iran Costa, whose agency has led the state’s education campaign, bristled at the suggestion that the campaign blames victims for Zika. Costa readily acknowledged that the lack of water supply is “a historical failure of Brazil as a whole,” and among “the most serious problems we have.” Eventually they will fix that problem; in the meantime, combat and education will have to do, he said. Fig. 6, Female Aedes aegypti laying eggs. In 2010, the United Nations Human Rights Council declared safe drinking water and sanitation a human right. The council tapped Heller to report on the issue around the world. He has yet to find a country that equally distributes inadequate infrastructure between poor and rich. In March, he and other U.N. officials issued a statement arguing that that research and pesticides alone would not defeat Zika. The world’s governments must instead invest aggressively in water and sanitation infrastructure, they said. “Of course it’s important to develop a vaccine — we agree with that. But the main measure, and the more immediate measure, must be water and sanitation,” he said. Imagine we do find a vaccine for Zika, but the infrastructure does not change, he mused. Aedes have been found to carry at least 115 different viruses; most are rare and, for now, confined to remote areas. But some are bound to cross oceans, as Zika did. Without infrastructure improvements, he said, those viruses will find abundant mosquito hosts and human victims. As always, poor people will be most affected, he said, but they won’t be the only ones. Since finding a home in Brazil, Zika has spread to 46 nations and territories, including the United States. More than 7,300 Americans have been diagnosed with Zika. Nearly 1,000 of them are pregnant. In the weeks before Adriana got the rash, eight others in her family fell ill with mosquito-borne diseases. Her father, Antonio, had what he believed was chikungunya. Her sister-in-law was diagnosed with dengue. 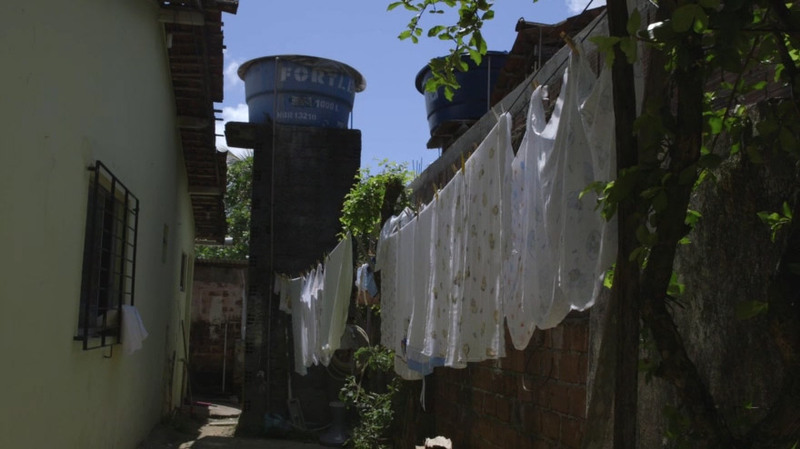 Morning outside of Adriana Reis' home in Alto José Bonifácio: laundry dries on a line, water storage containers sit on raised platforms nearby. One Sunday morning she woke up to blood on her underpants. She laid in bed for hours, feeling cold. That afternoon, she went to the bathroom and felt a rush of liquid that was not urine. An ultrasound at the emergency room revealed a grave loss of amniotic liquid and an infection. She was hospitalized. Two days later, her doctor told her that the baby was lost. The doctor removed the fetus from her womb. Adriana went home in a daze of pain and relief. It was only a few days later that the test results came back: The Zika test was positive, as her doctor had suspected from the beginning. 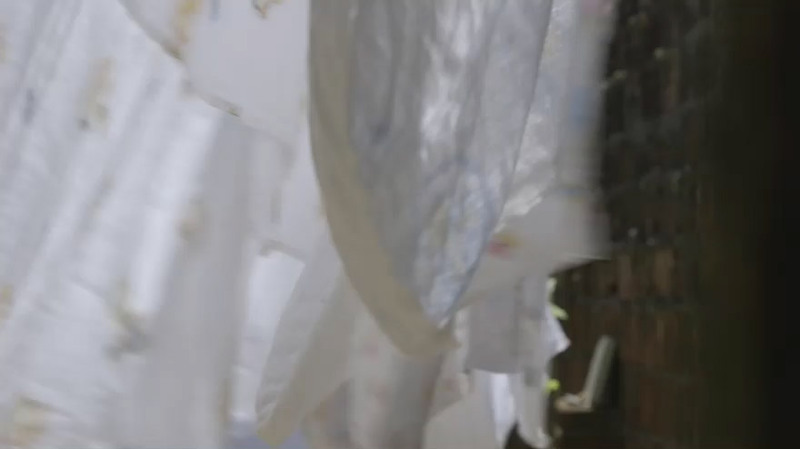 There are two other pregnant women in Adriana’s family. 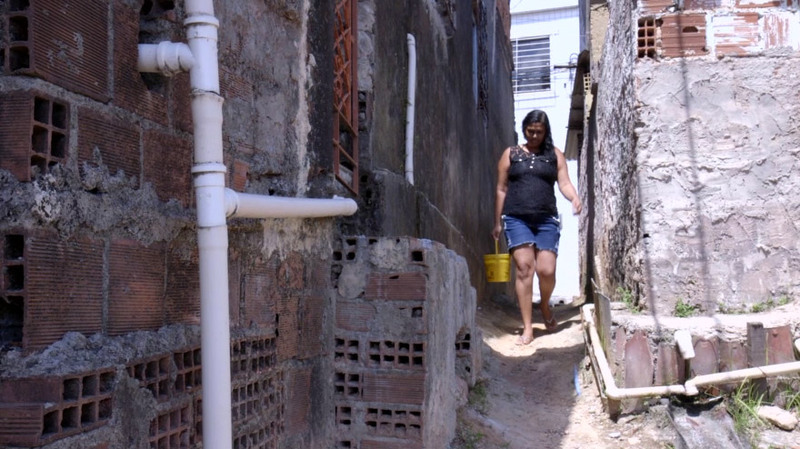 One, three months pregnant, lives in an upscale neighborhood that gets water every day. So far she’s stayed healthy. 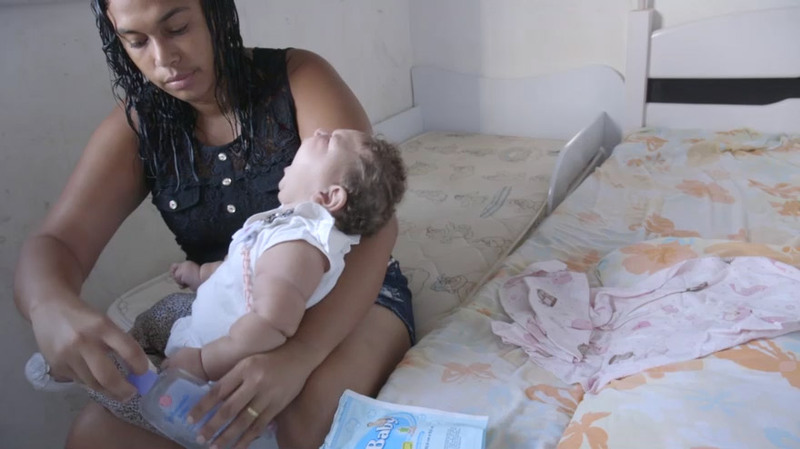 The other, five months pregnant, lives in a Recife suburb that gets intermittent water. She recently came down with a mosquito-borne illness. Written and reported by Katie Worth with video and additional reporting by Michelle Mizner. Translation and additional reporting by Renand Grando and David Santos; additional data analysis by Chris Amico and Eli Burnes; design and build by Dan Nolan and Ly Chheng; additional photography by Igo Bione.